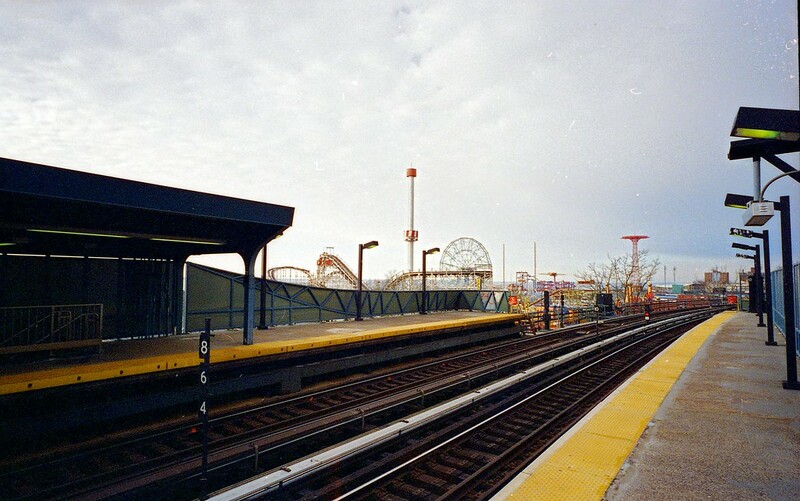 If you take the subway to Coney Island, you can get off either here at the Aquarium stop or at the Coney Island terminal two blocks down. As this stop comes first, I would expect that many impatient travelers would get off the train here, and if you’re on this end of the train platform, this is what you see, almost as a tease. So near, yet it will still be several minutes before you can work your way down the stairs, through the crowds, and then across Surf Avenue to get at the fun. Cool POV! I’d love to see this perspective at dusk with the Amusements lit. you know i love trains. and tracks. it’s been a while since i’v been surfing my buddies sites…really love the colors and vanishing points of the tracks and the rides in the distance. let’s shoot soon. John and Mike – I may have to go back there during season and in the evening to follow through on your suggestions.